The Men’s Torque Pro Swim Skins is your race day guardian angel. It is constructed with a slick, hydrophilic outer layer, so the water works with your suit, not against it. The result is an ultra low drag coefficient of .021 -- the lowest in its class -- which allows you to glide through the water with ease. Additionally, the SCSM6A mens triathlon suit has a hydrophobic inner layer with an impressively low .5% water absorption rate. In other words, this tri swimskin repels water to keep you light and dry from the inside, instead of weighing you down. Made with composite knit fabric, the Torque Pro offers a form fit for superior flexibility and freedom of movement. All TYR Torque Pro USAT legal suits are equipped with a coil zipper for a super quick transition, as well as secure beaded grip for maximum hold on your body. 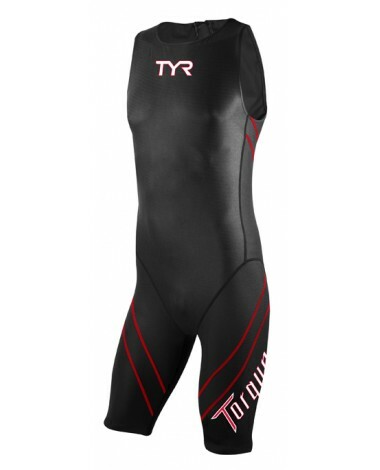 Conquer any challenge with the Torque tri suit! Fit is okay, but have a problem figuring out what to do with the cord attached to the zipper once zipped up. While swimming the cord moves around and wraps around my shoulder and arm. Unlike a wetsuit cord their is no Velcro to attach the end of the cord to. Pretty distracting during the swim. Q: What is the lifespan, how do I know when to replace? A: There is not a set Timespan on this product. Longevity will depend on how the product is cared for. Q: When comparing measurements to the size chart I seem to fit into the small category for everything except torso when I seem to slot into the medium (67in) category, is it worth sizing up in that instance or would the small likely stretch a bit to compensate? Or would it be better to go medium and assume the compressive nature of the garment still provide a snug fit? A: We would suggest in our Torque sizing up if needed, as this suit does not have a lot of stretch. The material content is 80% Polyester / 20% Spandex. The suit is meant to provide Hydrophilic Construction with little drag. Q: For triathlon, is this swimming skin is allowed when the big neoprene suits are forbidden with water temperature ? 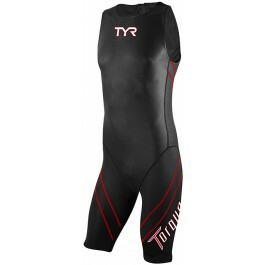 A: Yes, all Torque Swimskins are USAT / WTC legal. Q: What would happen if you used this suit as a tri suit for one race? Any Negative consequences for a 1 time only? A: Thank you for your inquiry. Swimskins are designed to be worn over your tri kit / tri suit and removed at transition. Q: Can a person put on the Torque Pro (or Elite) swimskin by themseleves? Do they need another person to zip it up? A: Thank you for your inquiry.The Men's Torque Pro Swimskin is equipped with a coil zipper for a super quick transition, you should be able to zip it yourself. The best of the best, the Men's Torque Pro Swimskin features a slick, Hydrophilic Outer Layer and an Ultra Low Drag Coefficient of .021. Combined with Hydrophobic Inner Layer construction, the Torque Pro provides an impressive .5% water absorption rate, keeping triathletes light and dry from the inside, maximizing speed in and out of the water.